Crocodile clamps, 51mm length. Screw fixing for cable. Great for using on test leads. Length : Approx. 51mm / 2.01"
NOTE: The item doesn't include screws and nuts. 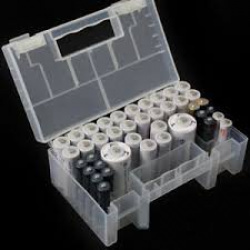 Fit for different kinds of batteries, such as AAA, AA. Can store 20 pcs AA size, 14pcs AAA size.